Resonessence Labs from Kelowna, British Columbia (Where's my road atlas?) sounded like an upstart to me, but it was founded by the engineers who designed the ESS Sabre 32 DAC chip, which is a pretty heavy credential all by itself. 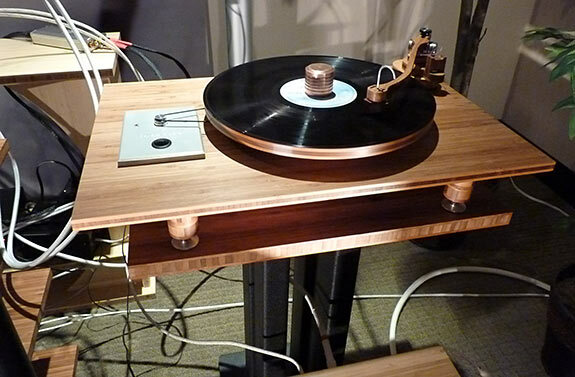 They put together a rig with a prototype amp that operates mostly in Class A that will be priced around $20,000, according to one of their engineers, Hans Looman. It drove a black tower speaker with brass screws anchoring the drivers from Westlake Audio, a company that dates back to 1971 and specializes in studio monitors with gorgeous wood horns. With the advent of basement studios, the demand for high end studio monitors has dwindled and Westlake has been re-tailoring itself for the consumer market. 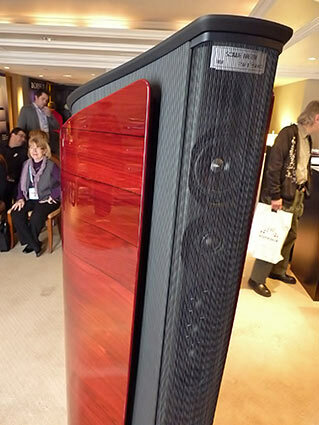 Their Tower 5, shown here, is a formidable looking speaker at $22,000. The side panels snap off to allow you to change the solid wood from one finish to another, satin black being standard. But what was really intriguing was an almost circular black ring suspended in front of the 5" drivers of this two-way design for dispersion control. With impedance that runs between 4 Ohms and 2 Ohms, a capable solid state amp is practically a prerequisite even though efficiency is 91dB/W/m. 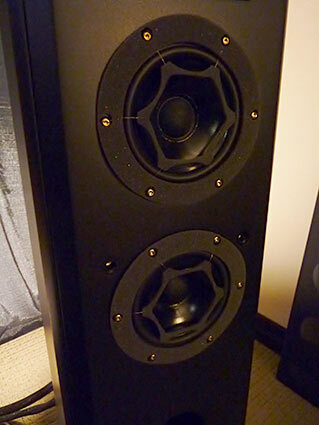 With a deep, taut bass, the Tower 5 was on the dark side with the music I heard. Mark Mallinson, president of Resonessence Labs, was also on hand as they showcased their Invicta, a remote controlled DAC/Preamp that offers a lot of flexibility with dual headphone outputs, selectable filter options that can be changed without glitches during playback, an HDMI output to display the playlist on a TV monitor, and a SD Card reader for FLAC, AIFF and WAV on SD, SDHC and SDXC cards. An SD card in the photo gives an indication of the size of the Invicta. On the performance side, it offers >125dB dynamic range, <-110dB THD (0.00032%), 24/192 and all lower resolutions and speeds, 80 kHz bandwidth, and USB input that is both PC and Mac compatible. Virtually everything is remote controlled, although the knob on the right of the faceplate also controls the volume and the menu. 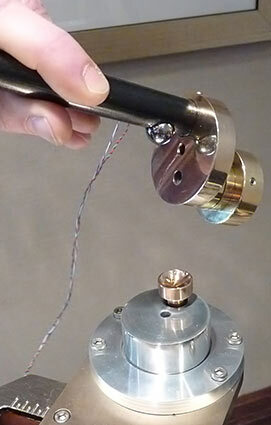 With both balanced and unbalanced outputs, this $3995 unit can become the center point of a very high end rig. DSD capability and resolution up to 384 kHz were mentioned, but I can't remember if it is available now, or will be shortly. Coming from the guys who designed the chip, we can expect that it maximizes the capabilities of the Sabre 32. 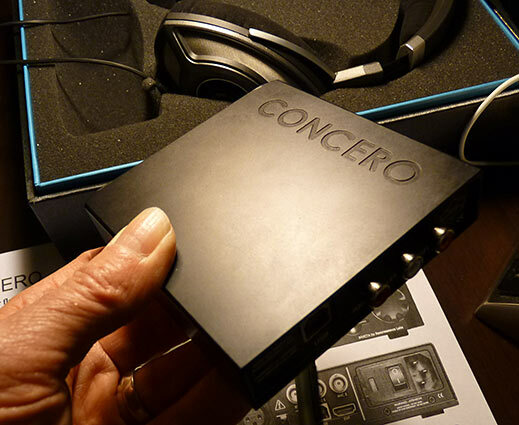 For those of us who are pretty happy with our rigs as they are, but wish to take advantage of the processing power of the flagship Invicta, Resonessence offers the Concero, a diminutive package at a diminutive price of $599, or $799 in April with DSD capability. It is a USB 2.0 DAC that works with both PC and Mac platforms. It can act as a USB to S/PDIF bridge, and it can be used as an S/PDIF DAC, powered by a USB power only connection. This, to me, looks like a really hot ticket with all its upsampling filters and ESS Sabre chip. 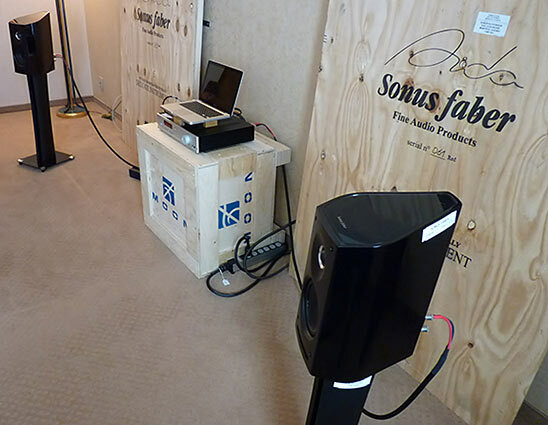 I was quite unprepared for the $120,000 Sonus Faber Aida loudspeakers in the Son-or- Filtronique room. Usually, when there is a room of this stature there is a line outside the door, or it is in a large conference room such as on the lower level of the Hilton Bonaventure. 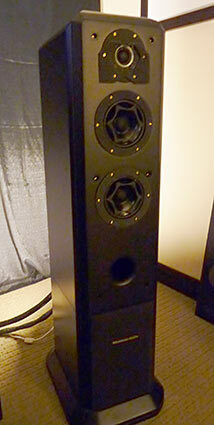 The suite was appropriate, however, for the Aida and the four Moon monoblocks lined up between the gorgeous towers. 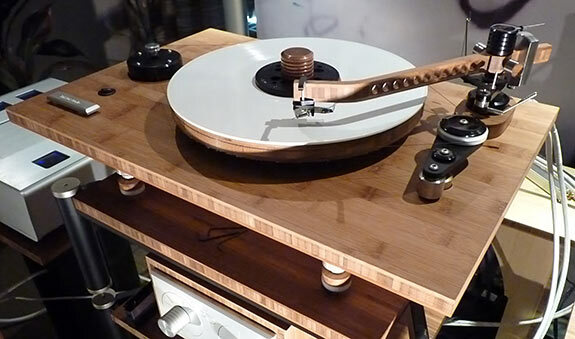 After listening for a moment the crowd thinned and the Kronos turntable grabbed my attention. Now seated on the completed Kronos stand, it was linked to a Nagra VPS phono stage on the middle shelf and the Kronos power supply on the bottom shelf. An Audio Research Ref. 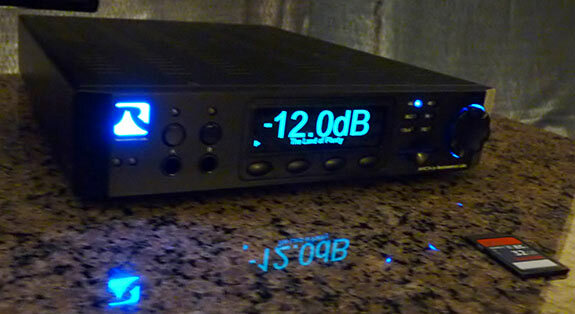 10 preamp ($31,500) was at the center of the system and an HRS rack beside it was filled with the dCs digital front end. With its supplemental rear firing drivers the Aida created a terrific sense of space and mastered both the micro and macro dynamics of the music. 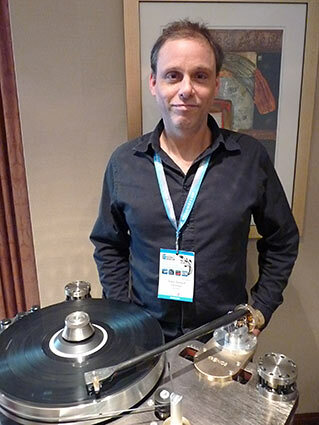 I was hoping to meet up with Louis Desjardins of Kronos, but instead encountered Andre Theriault who had completed the new Kronos unipivot tonearm in time for the show. Unlike most unipivot designs that utilize a pointed pivot bearing that is usually positioned above the level of the LP surface, Andre's arm is a ball-in-cup design with the pivot point at the same level as the contact point of the cartridge on the LP. Louis explained to me on Sunday that with the diamond point and the tonearm pivot point at the same level, it is much easier for the arm to maintain proper azimuth as it screams down the groove. And with the ball-in-cup pivot, there is no chatter as he claims happens with more traditional unipivot designs. On a return visit on Sunday Louis played Cheap Sunglasses from my ZZ Top Deguello LP (I had just heard them live in November.) and answered with a Rolling Stone instrumental from "Sticky Fingers". (He later wrote that we drove a journalist from a traditional magazine out of the room.) He then popped on a re-master which I immediately recognized from the opening notes as Elvis Presley singing "Are You Lonesome Tonight?" that was positively haunting. He had not left the building after all. Louis then proceeded to blow me away with another big band piece as he had done last fall at the TAVES show. This rig was capable of being both delicate and moving a lot of air. It was quite a learning experience for me. While ZZ Top and Jackson Browne sounded better on the less expensive tube rig in the High Water Sound room, Elvis and big band music excelled in this megabuck (like half a million dollar) rig. The experience really underscored the importance of listening to your own music, preferably in your own home, when auditioning new equipment. A gracious tip of the hat goes to Son-or-Filtronique for putting together one of the Very Best Rooms at the show this year. As if that were not enough, Son-or-Filtronique offered a rig with a Moon 340i integrated amplifier with USB DAC, Sonus Faber Venere 1.5 speakers and BIS Audio cables as a $5000 promotional rig at a show special of $4995, 28% off list price. It was on active display in the upstairs bedroom of their large suite, which I think many visitors missed out on, unfortunately. 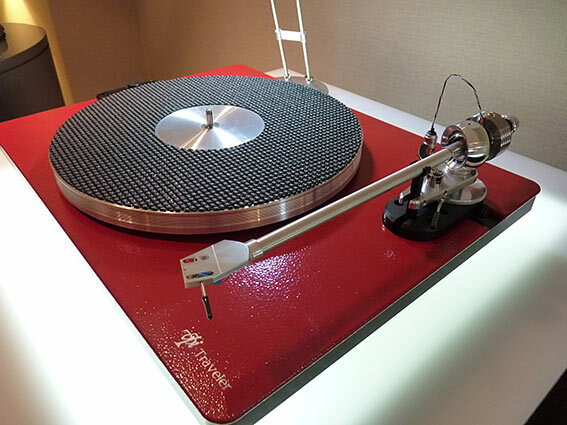 And on silent display I caught my first glimpse of the new VPI Traveler turntable ($1299) with its double gimbal bearing tonearm, eye catching red plinth and mat that reminded me of the Extreme Phono None-Felt mat I reviewed back in 2002. 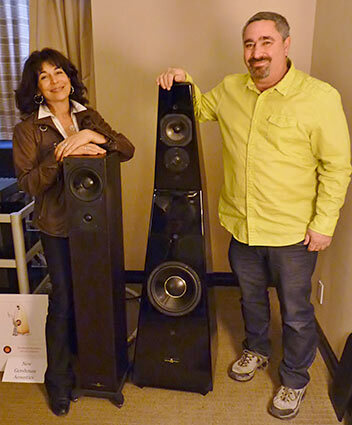 There was a 20th anniversary going on in the Gershman Acoustics room, not for Eli and Ofra Gershman, but for their GA-P 828 loudspeaker that has a new woofer and crossover and still is an outstanding design � both visually and acoustically. At $25,000 it is a competitor of their own Black Swan that goes for $45,000. The GA-P was one of the speakers that caught my heart when I first entered this sport and it was one of the Best Rooms here again at Montreal. On a return visit on Sunday I heard the entry level Idol ($3000) shown here with Ofra, and re-experienced its very high level of performance. Sometimes it's ok to spend less. I also noticed that they had expanded the use of the cut-out wood grille to the GA-P and Ofra re-affirmed that it provided a clearer, more open sound than traditional cloth grilles. Music was sourced from a computer and run into a Naim server which fed Naim monoblocks. Thick, braided Gutwire power cords were clearly evident in my photos. The smaller Tri-Art Audio Pebbles turntable ($1200) that I had heard about at TAVES has come to fruition and I was able to play a familiar Jackson Browne cut on it. This thing really works! The low bass was a little soft, but that might not have been the table's fault. Their larger turntable, The Bam Bam at a price that is still being figured out, was on display, but wasn't quite ready for prime time. Just looking at it, you can tell that it takes a lot more work to produce than the Pebbles table. Also on display was the Pebbles series CD/DVD player at $550. I find the concrete and bamboo design of the Tri-Art gear both intriguing and appealing. 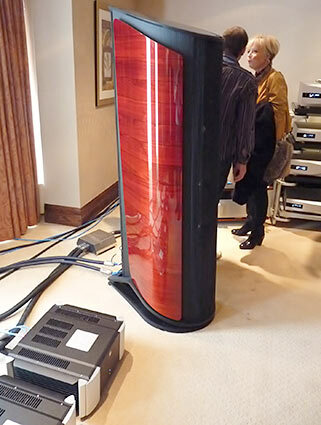 The rig seemed to be better sorted out than what I heard in Toronto last fall, as the music coming from the excellent Rosso Fiorentino Certaldo speakers ($5995) was one of the Best Rooms at the show this year. Possibly this was due to new 50 watt Class D monoblocks ($TBD)? Also note that the top two drivers of the Certaldo are available as the Pienza stand mounted monitor ($3000). These guys from Avatar Acoustics (who supplied their Mach 4 Power Distributor) and Tri-Art Audio keep getting better and better. That's it for Part 2, but there's still a lot more to come. ---> Part 3 Salon Son & Image Report 2013 show coverage.